Now this is livin'! The perfect country estate with a 20-acre backyard playground! This captivating property is surrounded by towering spruce, majestic oaks, and rolling hills with a network of trails for experiencing the Great Outdoors. A marriage of forethought and functionality, this very well maintained ranch home with a sprawling yard, and the "must have" outbuildings, maximizes the comfort and convenience of this enviable property. In other words, it's perfect! Special features of this pristine split-ranch include cathedral ceilings in the living, dining and kitchen; spacious living area with a brick/wood burning fireplace; eat-in kitchen with generous cabinetry and counter space, and a distinctive 2-sided breakfast bar; large dining space with built-in cabinetry; a gorgeous sun room finished in warm knotty pine, complete with a panoramic view of your very own 20-acre wildlife mecca; excellent master suite with garden tub, separate shower, and double closets; full basement (clean!) with bonus room, storage rooms, laundry, workshop, and a wood stove for an optional heat source; private 12x24 concrete patio & 10x20 deck overlooking the land; low-maintenance vinyl siding; 2-car attached garage; two 12x16 storage sheds with electric; nicely wooded front yard; asphalt drive. All furnishings, John Deere lawn tractor, snowblower, and air compressor are included, and there's also no extra charge for the deer and turkeys that will wander in like pets! 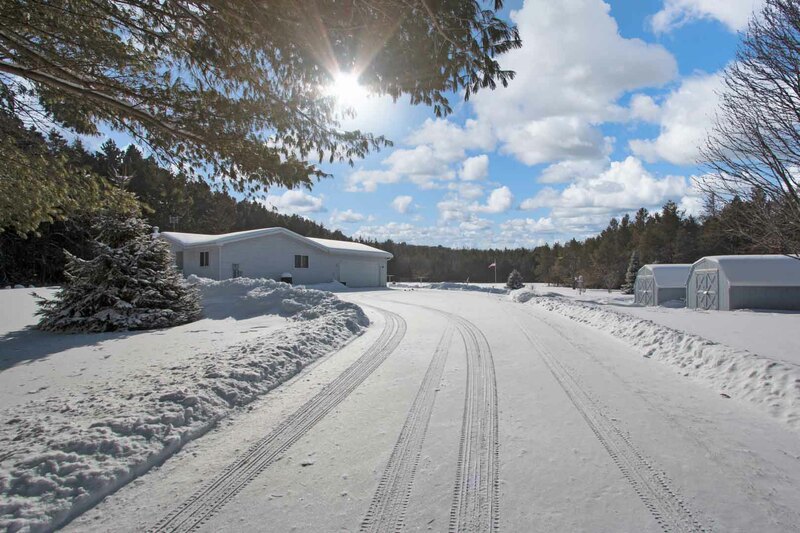 If you're getting ready to back off the throttle and enjoy life's simple pleasures, there would be no finer place than this immaculate property. Take me home, country road! Garage: 2-Car Attached. Two 12x16 Sheds. Screened Porch: 4-Season Sun Room - Knotty Pine Throughout. Nice! Location: Superb Country Location on 20 Gorgeous Acres!